In honor of Alan Rickman, here’s a sketch from my new book “Impressions of Wine Country.” Aside from his role in the popular Harry Potter series, Rickman starred in countless other films. One of my favorites is his turn as British wine merchant Steven Spurrier in “Bottle Shock.” The film captures a pivotal moment in California wine’s history, as it transitioned from a serviceable bulk product to its current status as a serious contender in today’s world of wine. It was Spurrier (played in the film by Rickman), who organized the blind tasting of 1976 that has come to be known as the “Judgment of Paris.” Though the screenplay is not historically accurate, the story is fun, and of course, Alan Rickman’s performance makes it all worth while. 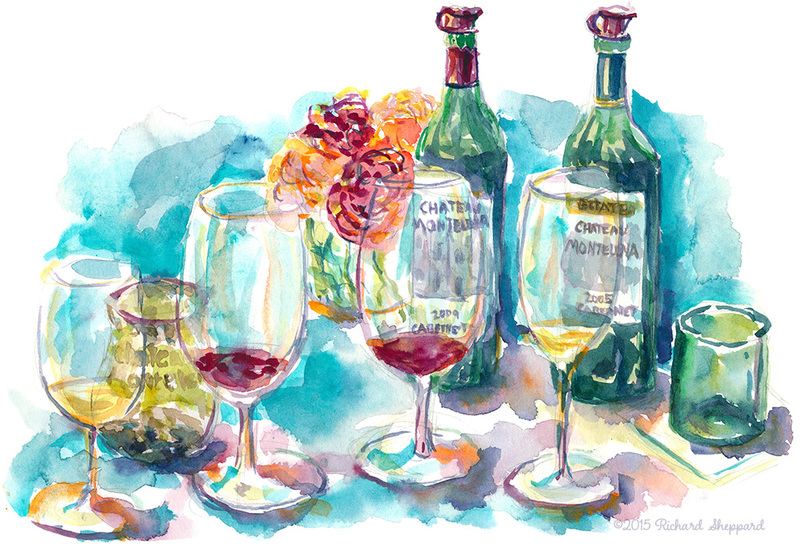 I drew this sketch in the Sun Room at Chateau Montelena, while tasting their Chardonnay, Cabernets, and newly released Riesling. If you haven’t yet been to the winery, I highly recommend a visit, as its estate is as gorgeous as are its wines. January 14, 2016 Richard SheppardComments are off for this post.